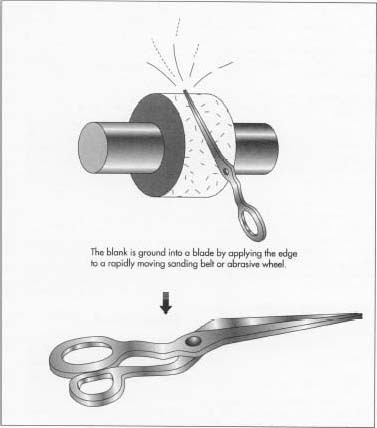 Scissors are cutting instruments consisting of a pair of metal blades connected in such a way that the blades meet and cut materials placed between them when the handles are brought together. The word shears is used to describe larger instruments of the same kind. As a general rule, scissors have blades less than 6 in (15 cm) long and usually have handles with finger holes of the same size. Shears have blades longer than 6 in (15 cm) and often have one small handle with a hole that fits the thumb and one large handle with a hole that will fit two or more fingers. Scissors and shears exist in a wide variety of forms depending on their intended uses. Children's scissors, used only on paper, have dull blades to ensure safety. Scissors used to cut hair or fabric must be much sharper. The largest shears are used to cut metal or to trim shrubs and must have very strong blades. Specialized scissors include sewing scissors, which often have one sharp point and one blunt point for intricate cutting of fabric, and nail scissors, which have curved blades for cutting fingernails and toenails. Special kinds of shears include pinking shears, which have notched blades that cut cloth to give it a wavy edge, and thinning shears, which have teeth that thin hair rather than trim it. of being forged entirely by hand, blades and handles were now formed by using drop hammers. Powered by steam, these large, heavy devices used dies to shape the scissors from bars of steel. Modern versions of drop hammers are still used to manufacture scissors today. Scissors are usually made of steel. Some scissors used for special purposes are made from other metal alloys. Scissors used to cut cordite (an explosive substance resembling twine) must not produce sparks. Scissors used to cut magnetic tape must not interfere with magnetism. Steel scissors exist in two basic forms. Carbon steel is used to make scissors in which the blade and the handle form one continuous piece. Carbon steel is manufactured from iron and about 1% carbon. It has the advantages of being strong and staying sharp. Scissors made from carbon steel are usually plated with nickel or chromium to prevent them from rusting. iron, about 1% carbon, and at least 10% chromium. It has the advantages of being light and rustproof. The handles of stainless steel scissors are made from a strong, light substance such as ABS (acrylonitrile-butadiene-styrene) plastic. 1 Before they are sharpened and attached, the two halves of a pair of scissors are known as blanks. A blank may consist of a blade and a handle in one piece or it may consist of only the blade. In the latter case, a metal handle will be welded to the blade or a plastic handle will be attached to it. 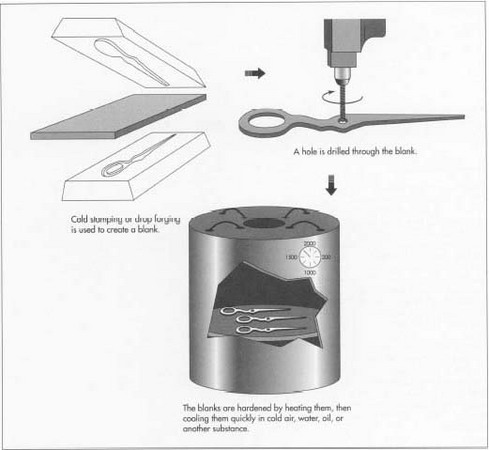 2 Inexpensive scissors may be made from blanks formed by cold stamping. In this process, a sharp die in the shape of the blank is stamped into a sheet of unheated steel. The die cuts through the steel to form the blank. 3 Blanks may also be made by molding. O Molten steel is poured into a mold in the shape of the blank. The steel cools back into a solid and the blank is removed. 4 Most quality scissors are made from blanks formed by drop forging. Like cold stamping, this process involves shaping the blanks with a die. This die, known as a drop hammer, pounds into a bar of red-hot steel to form the blank. The pressure of the drop hammer also strengthens the steel. 5 The blanks are trimmed to the proper shape by cutting away excess metal. A hole is drilled through the blank. This hole will later allow two completed blades to be attached to each other. 6 The trimmed blanks are hardened by heating them, then cooling them quickly in cold air, water, oil, or another substance. The temperature to which they are heated and the medium in which they are cooled varies depending on the type of steel from which they are made and the desired characteristics of the blade. 7 The hardened blanks are heated again and allowed to cool slowly in air. This second heating, known as tempering, gives the blank a uniform hardness. If the blades of a pair of scissors did not have uniform hardness, the harder places on one blade would soon wear out the softer places on the other blade. 8 The repeated heating and cooling causes the blanks to warp. They are straightened by being placed on an anvil and lightly tapped with a hammer. This process is known as peening. 9 The blank is ground into a blade by applying the edge to a rapidly moving sanding belt or abrasive wheel. The surface of the belt or wheel is covered with small particles of an abrasive substance and works in the same way as sandpaper. The hard abrasive grinds away enough steel to form a sharp edge. During this process, the blade is cooled with water or various liquids known as cutting fluids to prevent it from heating and warping. The sharpened blade is then polished in a similar manner using belts or wheels, containing much smaller particles of abrasive. 10 For many scissors, the handles are I 0 / formed from the start as part of the blank. If not, they may be made of a metal alloy or from plastic. If they are metal, they are made in the same way as the blanks and then welded to them. If they are plastic, they are made by injection molding. In this process, molten plastic is forced under pressure into a mold in the shape of the handles. It is allowed to cool and the mold is opened to remove the handles. The handles contain hollow slots into which the end of the blanks can be inserted. A strong adhesive is used to keep the handle firmly attached. 11 Two polished blades are attached to each other by a rivet or screw through the previously drilled holes. Rivets, which cannot be adjusted by the consumer, are used to make less expensive scissors. Adjustable screws are used in more costly scissors. 12 The scissors are adjusted to ensure. that the two blades work together correctly. They may be painted or plated with nickel or chrome to protect them from rust. The scissors are inspected for flaws, the screw or rivet is lubricated, and the scissors are wrapped for shipping to consumers. The most important aspect of quality control for scissors is the proper alignment of the two blades. In order for scissors to cut smoothly, the blades must meet at two points only. These two points are the swivel (the point where the rivet or screw connects the blades) and the cutting point. The cutting point moves from just beyond the swivel to the tip as the scissors are closed. The blades are prevented from meeting at any other points by giving them a slight horizontal and vertical curve away from each other during manufacture. In order to ensure that the blades meet correctly, the holes must be drilled to within one ten-thousandth of an inch (about one four-hundredth of a millimeter) of the correct position. The position of the blades is inspected visually to see if the blades meet evenly. If not, a portion of one blade will overlap the other. This defect is known as a wing. The tips are also inspected to ensure that they meet evenly, without a gap between them or any overlap. Because even dull scissors are able to cut paper adequately, quality scissors are tested on tough synthetic fabrics. Sharpness is tested by making sure the blades cut the fabric rather than tear it. Strength is tested by cutting through multiple layers of fabric. The blades should come together with a constant pressure during cutting. The consumer is responsible for maintaining the quality of the scissors. Scissors should only be used to cut the materials for which they were designed. They should be oiled and sharpened regularly, and the screw should be adjusted as necessary. Scissors should be stored in a closed position. Setting down scissors in an open position is the most common cause of dull blades. Although scissors have remained in a standard form for hundreds of years, recent innovations may change the look of this ordinary household tool. Scissors using round, rolling blades have been designed. Ceramics made from zirconium oxide have been used to manufacture scissors with blades which are extremely strong, rustproof, and which never need sharpening. "Scissors and Shears." Consumer Reports, October 1992, pp. 672-677. Werner, Karen Flake. "Cutting With Scissors: Three Steps to Easy Snipping." Parents Magazine, January 1996, pp. 137-138. Allison, John. "The Anatomy of Quality Scissors." Knife Connection. May 30, 1996. http://www.knife.com/news/scissor.htm (July 14, 1997). This article was excelent, it gave me almost all of the information I was looking for, and more, and I do have a suggestion. I think a diagram showing the parts of scissors would really help, because I think that the fulcrum, effort force, load force and power source should be displayed on the diagram. Thank you. Scissors can also be made from copper, aluminium, nikel, alloy, iron, plastic and even rubber.